The Earthwise 7.5 Inch TC70025 Corded Electric Tiller is the best small rototiller you can buy for the value it provides. It’s Spring. Which means it’s a new beginning for your garden. But there’s a lot of work to be done. And tilling the soil to get it ready for your plants is a chore. It can be hectic trying to till the soil with a spade. It’s not fun and takes a lot of time and effort. But you don’t have to worry because a good rototiller can help you get this work done fast. 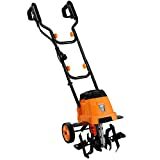 Let’s look at the best small rototiller you can get that will help you prepare your garden soil. And then you can grow those wonderful plants you’re thinking about. 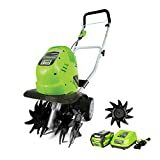 What is a small rototiller? What are the different types of rototillers? Do you need a small rototiller? A rototiller is a device that cuts and chunks up the earth so that you don’t have to do it by hand. It works by means of several rotating barbed wheels, called “tines.” A motor turns the tines, and they work the ground as you push them along. A small rototiller is any rototiller that is smaller than the standard size. All of the products that we will review fall into this category. These tillers are much better suited for small jobs. For instance, if you just want a flower bed along the edge of your home, you don’t need a full-size tiller to do that. There are several different types of rototillers out there, but most of them work the same way. The main difference is size. There are three basic sizes of rototillers, and they are suited for jobs of different sizes. The smallest rototillers usually look a lot like weed-eaters, except with different blades on one end. These models tend to bounce around a lot when they encounter hard ground, and this can be a safety hazard if the machine is not properly controlled. Small rototillers are almost always front-tine, which means that the blades are in the front. Medium and large rototillers may have tines in the front or the back and are much heavier. This is mostly due to the heavier engines that are required to run these large machines. Unless you’re a farmer, you don’t need one of these. 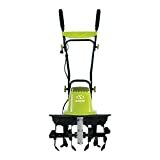 A small rototiller is what you need if your tilling requirements are small. These are well-suited for older people who want to grow a small flower garden or smaller people who just can’t handle the weight of a large tiller. It is possible that you may not need a tiller at all if you are doing an extremely small area. There are certain factors that can help you make the best buying decision for a small rototiller. You should always try to find a model that feels as comfortable as possible while it is running. It is hard to do this when looking at a tiller in the store. However, you can at least stand behind it and put your hands on the grips. Stand up on your toes a little bit to simulate the sink that the tiller would normally have as it digs into the ground. This can at least give you some idea of how hard this tiller will be on your back. Always make sure that your tiller comes with a good warranty. A company that won’t ensure the quality of an expensive product like this does not deserve your business. Some warranties are much more generous than others, but it is always a good sign to see one being offered. Safety is of the utmost importance when buying a product that works through the action of spinning blades. Like a weed-eater or a lawnmower, this is a machine that can cut you badly if the wrong malfunction occurs at the wrong time. You should make sure that your tiller has at least some kind of safety guard that will prevent any dislodged tines or pieces of sharp material from flying at you. At the bare minimum, a rototiller should have a wide-flared wheel guard. You will also need to decide whether you want a gas-powered model or an electric model. Both have their distinct advantages and disadvantages. A gas-powered tiller will generally be more powerful. It eats the ground up with a speed and power that nothing else can match. Of course, gas isn’t cheap. It’s also very dirty-burning and isn’t good for the environment. An electric tiller will not have quite the same chunking power as its gas-powered ancestor, but it’s a lot cheaper to operate and a lot better from an environmental perspective. The downside is that you have to either use a drop cord or gas-powered generator, which would make the whole thing irrelevant. You want to be able to reach the start button without putting yourself too close to the tines. This is more of a factor on gas-powered models since they require a vigorous pull to start the motor. You should also examine the thickness of the tines themselves. These tines are the main working part of the machine. Everything else is just there to facilitate the movement of the tines. So, they also need to be the most durable part of the machine. Bent tines have a tendency to get caught against other tines, and before long you have a total equipment failure on your hands. No other part of the machine will be in constant contact with the earth, except the wheels. Sturdy wheels are also a must, and people often overlook this factor. All but the smallest tillers require wheels in order to ensure a smooth and even motion. More to the point, a tiller without wheels would be hard on your back. The exceptions, of course, are the super-tiny tillers that are so lightweight as to negate the need for wheels. When buying a wheeled model, take a moment to “kick the tires,” as the saying goes. Don’t literally kick the tires, but do inspect them closely. Finally, you should take a good look at the price trends across different brands and models. This will give you a good idea of what is reasonable and what is not. A little research of this type is essential if you want to avoid wasting your money. A rototiller is an inherently dangerous tool. This is not just because of the fact that its main purpose is to spin a bunch of bladed wheels. The machine is also inherently dangerous because it is digging into a hard surface that might contain unknown materials. You never know what might be in the ground. You could run into broken glass, medical waste, shards of rusty metal, and who knows what else? When one of these small and dangerous objects is sent flying, the result can be very bad. This is why you should always wear safety glasses when using a rototiller. Rototillers are also dangerous because they are close to your feet. The most common rototiller injuries are injuries to the legs and feet. You can minimize this risk somewhat by wearing thick pants. Make sure they are not loose-fitting pants, as these will have a greater chance of being caught in the tines. You should also get in the habit of working with the blades as far away from your feet as possible. You should also never use a rototiller when you are at home by yourself. If you happen to be injured, you will need help immediately, and you could bleed to death if someone isn’t there to help. A rototiller is a pretty simple device. If you know how to start a lawn mower, you will have no problem starting a gas-powered rototiller. For an electric model, it’s even easier. These models usually have a switch and/or a button to engage the tines. Regardless of what kind of tiller you have bought, the basic process is the same. When the tiller starts, you give it a moment to dig into the ground and turn it thoroughly. When it has done a good job, you will be able to feel a slight lessening of the resistance. This may take some experience to feel. Now move the tiller forward and repeat the process. You can rock the tiller forward and backward just a little bit, but be very careful with this. It is only good to do this when your tiller is bogged down at a rough spot, and you need some extra kick. From time to time, you may find that you need to stop the tiller and clear debris from the tines. This is a particularly frequent problem in soils with a lot of clay. A long and flat-headed screwdriver is probably the best tool for picking clay and rocks out of the tines. No matter how good your tiller is, this problem will happen once in a while. You need to always make sure that your tiller has plenty of oil. Without a sufficient reservoir of oil, a gas-powered tiller will tend to overheat and cause all sorts of problems. You may think that it’s easy to find someone who will work on a tiller, but shops will often charge more for a less-common repair job like this one. You should also give your tiller an oil change from time to time, even if you don’t find it necessary to add more on a regular basis. All you have to do is take a flashlight and shine it down into the oil tank. If it is excessively black, you should go ahead and change it. Thick black smoke coming from the exhaust is another indicator that your oil needs to be changed. After using a rototiller, you should always clean the tines. Don’t use a garden hose if you have an electric model, even if the machine is supposed to be waterproof. It just isn’t worth the risk. Most models will have an air filter that should also be changed regularly. An engine has to breathe just like a human body, and it can’t do that with a dirty filter. Sometimes, a minor engine problem can be as simple as washing the filter foam with soap and water before allowing it to dry in the sun. This is one of the smallest tillers around. The entire thing handles like a weed-eater and is even lighter than some weed-eaters. This is an electric model that requires a cord to run properly. The cord is a little too short, but I guess the manufacturers figured that people would use an extensions cord anyway. This thing appears to have a plastic outer casing. Even though this is very thick, I find it to be concerning. Still, this product gets very good reviews so it must be holding up reasonably well. This machine has only four tines, and they aren’t very large. I would only recommend this tiller for the tiniest of jobs. However, this product does well for the light purposes for which it was designed. Just be aware that these super-tiny tillers tend to bounce around a little bit more. This is one of the more heavy-duty tillers on this list. It has six tines rather than four, and they look to be quite thick and durable. The best thing about this tiller is that it doesn’t bounce around like other small tillers. This machine is meant to be tilted back as it works, reducing the pressure on your back and allowing the wheel guard to function as a protective shield for your feet. The wheels on the Sun Joe are pretty thick, but I would say that the handles are too thick. The grip isn’t terrible, but I would have preferred a more traditional handle design. This is an electric corded tiller like the last one. This is another big boy. It only has four tines, but they are extra large and very thick. They are held in place by a simple pin, which would probably make it easier to clean this tiller if mud and clay become lodged in the tines. This model can be adjusted for multiple tilling depths, which makes it a versatile machine when compared to most others. One great thing about this tiller is that it looks and handles much like a lawnmower. This is great because everyone knows how to work a lawnmower. It’s also good because the wheels are between your feet and the tines. This feature makes me feel quite a bit safer when using this product. The Greenworks 27062 is a small rototiller that comes with a 40V Lithium-Ion battery. There are 4 8-inch forward rotating tines that help you dig the earth with minimal effort. The tilling width can be adjusted up to 10 inches and the tilling depth can reach up to 5 inches. This helps you dig up a good portion of your garden fast and to the depth you need. It comes with large 6 inch wheels and gear drive transmission. This helps you move it around with ease even in tough garden areas. The VonHaus is a sleek little machine that offers an ergonomic treat. The handles feel really good and allow the user to maintain proper control at all times. I like the fact that these tines are so thick and wide. I don’t think I could bend them with a pair of pliers. For an electric model, this thing is pretty powerful. In spite of the plastic covering, you can look underneath and see that this thing is made almost entirely of steel. Although this may be a cosmetic factor, it really is reassuring. I also like the fact that the handle can be adjusted down to very precise specifications. We recommend the Earthwise 7.5 Inch TC70025 Corded Electric Tiller as the best small rototiller you can buy. It’s very lightweight and gives good enough performance for a small garden with it’s 2.5-Amp motor. You can get it to till up to 7.5 inches wide and 6 inches deep which is suitable for a small garden. It’s small, ergonomic, easy to use and store when you don’t want to bother with it.